And, by soon I mean in just a few days we're going to be revealing some pretty big changes to the GigMasters website and service. We've been busting at the seams for months to tell you about what we've been working on, but we had to wait until now (we didn't want to tip off any of our 'impersonators'). Truth be told, many of these ideas came from our amazing members who aren't shy about telling us what they think - and we just love that! High-Impact Profiles - The new member profile design will give our members control of more visual space. This means that when someone lands on your new profile, they will get a quick, clear impression of who you are and what you do. Flexible Search - Clients will be able to customize their searches like never before, expanding and narrowing their vendor options with our new search interface. This means a more satisfying, customized experience for our clients and higher quality leads for you, our members. Slicker Navigation - Navigating the site will be quicker and easier than ever. 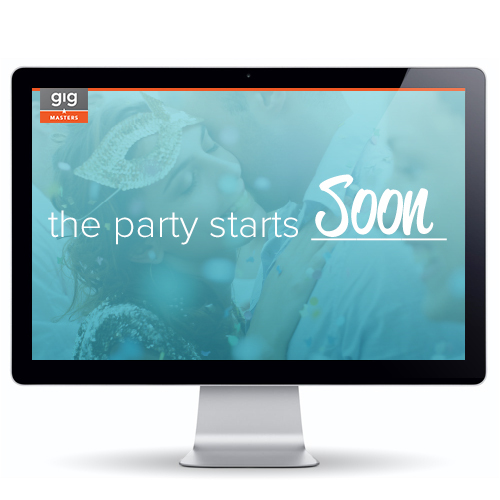 All a client needs to know when they come to our site is the type of event they are planning - and we'll do the rest. I've got to get back to work so we can get this baby launched. Follow our Twitter hashtag #thepartystartssoon for more screenshot reveals and up-to-the-minute announcements.